For a level 8 party! A duergar mining expedition has led to a curious find - the entrance to the mythical Forge of Creation, where the first dwarves supposedly created the tools that brought civilization to the world. Their discovery has not gone unnoticed though, as their toiling within the forge has activated a portal to the Elemental Plane of Fire, drawing the attention of the efreeti Camus, Eyes of Midnight. The PCs are caught in a clash between the efreeti sultan and the meddlesome duergar, and must survive threats from each faction and the dangers that lurk within the forge itself! Fierce Tempers is part of Dungeons on Demand: Volume One. Player Safe Maps - Maps for each encounter area (and the dungeon as a whole) come prepared for both the players and GMs. Helpful for when you want to give the party something to visualize without revealing hidden monsters, traps, and treasure. 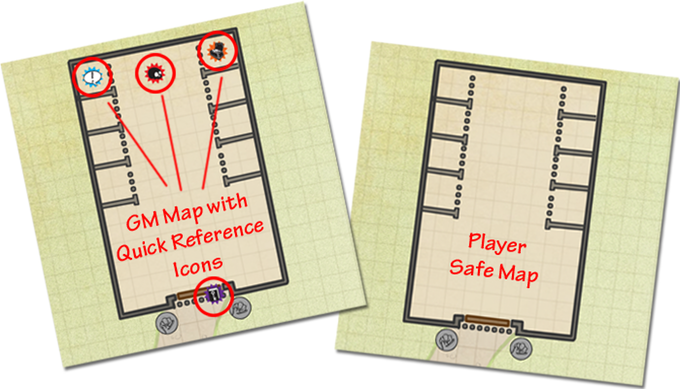 Quick Reference Icons - GM maps are fully labelled and complete with quick reference icons. These icons give you all the information a GM needs for an encounter area - whether there's monsters lurking to fight, traps the party must contend with, hidden treasure, NPCs to talk to, or a puzzle they must solve. Each icon is given a complete description in the encounter break down. Combat Difficulty Gauges - Each encounter description provides detailed information on how monsters perform in battle. These gauges allyou to quickly determine how difficult a fight will be for an appropriately leveled party. These gauges rate an encounter from 1 star (very easy) to 5 stars (deadly). Complete with core rulebook page references and full descriptions of custom monsters! This title is included in Dungeons on Demand: Volume One! Kind of curious what the scale of the map was intended to be. It's marked as 5' squares, but under those circumstances the Baron would be unable to fit through any of the connecting corridors, and some of the combat encounters (such as the turning gear) feel like they'd pack the corresponding room to impassibility. The portal on the top floor is described as 20' in diameter, covering two squares, so that support the idea of 10' squares, but then the final room is described as 50', and covers 10 squares, so that's definitely 5' squares. Wilhelm, I reviewed the map and materials after your reply. The scale is right at 5' per square. The portal illustration extends past the two center squares (though it is partially obscured by the GM Icons on the area overview map), and the scale is intentional to give combat encounters with larger opponents a cramped feel. As far as the giant goes, the intention was to have him squeeze (PH 192) through the corridors to get around, but I agree at 5' scale it appears like a Huge creature would be too big. Until I can get an update up my suggestion would be to allow the giant to squeeze as originally intended, stating the corridors are slightly wider than the maps indicates. Thanks for the heads up! Thanks for the quick reply! My solution for the moment was to scale up the map by about 50%, which was super easy using the ungridded version that's included. It's great that the module includes this, makes the module so much easier to use with virtual tabletops like Roll20. An excellent adventure! Got into Dan Coleman's stuff by getting the Dungeons on Demand deal and this was the first one I tried out. With some minor changes I was able to work Fierce Tempers in my Rise of Tiamat campaign. It led to one mayor plot decision for the party (do we give the Mallus to The Zhentarim so they can protect the Black Road in Anauroch (underneath which this adventure took place) from the Cult of the Dragons endless incursions into the Great Desert or do we destroy this priceless artifact? The module itself and the maps are incredibly easy to use. Every room is described in great detail (but with lots of room to change stuff) on one or two pages, with easy to find information about the combats, traps, NPC's etc. Tried adding this as a review but for some reason it's not showing as purchased. Maybe because I got the Dungeons on Demand pack. For what it's worth, I give it five stars. Nice adventure, but one of the first named enemy NPCs you encounter (Silek Dar'Tor) has no stat block. It is listed as being in Appendix A, but it is not there. Adam - it looks like the statistics block was accidentally cut during the update to include player safe maps. I just uploaded a revision to this module with his stats - you should be able to download the corrected copy now. Thank you very much for bringing it to my attention! Excellent! Thank you for the awesomely rapid response!